From Lymington, M was with his all-time favourite crew, Anna. He was happy – just a bit sorrowful because Anna wasn’t aboard for long enough (she “has a life” as people say, whereas M’s life is all afloat). 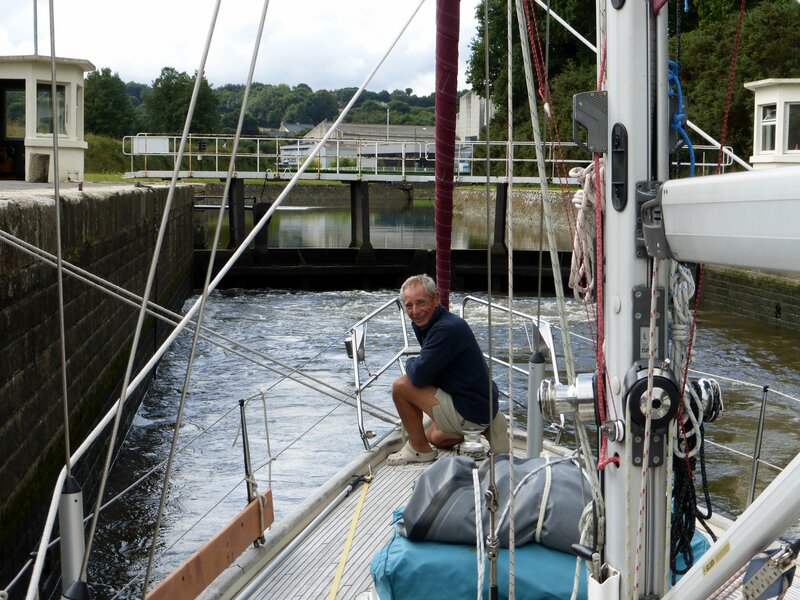 From Lymington it was time to head generally south or west. Spain is quite a long way away and summer doesn’t last forever in Northern Europe. Via anchorages at Totland Bay, I.o.W., and Worbarrow Bay in Dorset – for a drizzly walk to Tyneham – we reached Dartmouth. Anna left for grandmotherly, motherly and daughterly responsibilities at home. Beautiful, smart new covers were delivered in Dartmouth and fitted by Rowan. Here’s a picture. Bob H and Stuart G arrived and next day we headed west…then south. As a typical example of M’s mid-passage destination flips, ‘we’ changed our mind and headed not west to Falmouth but south to Sark in the Channel Islands, because wind was better that way. 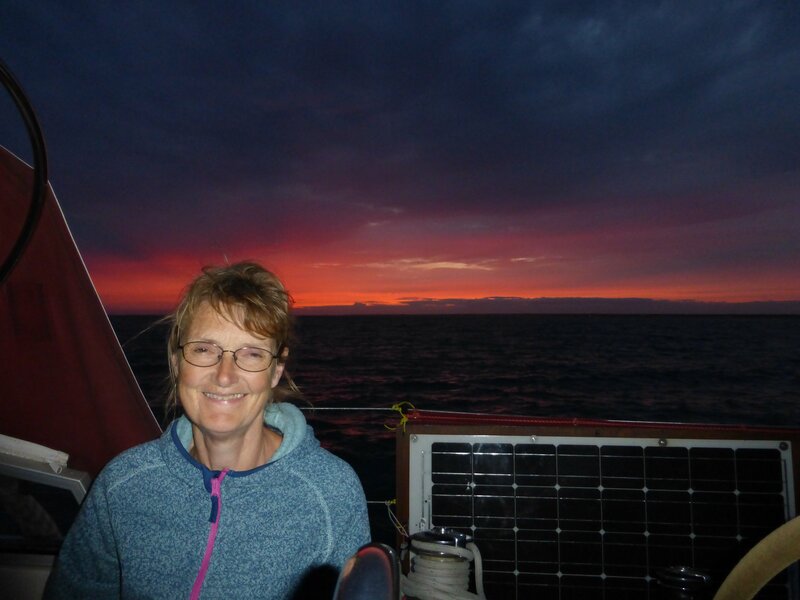 Arrived in middle-of-the-night darkness with strong tides among the big rocks of little Sark (this is where sailors and boats start to rely on their navigation magic and wizardry apps). Next day, a brief walk ashore. 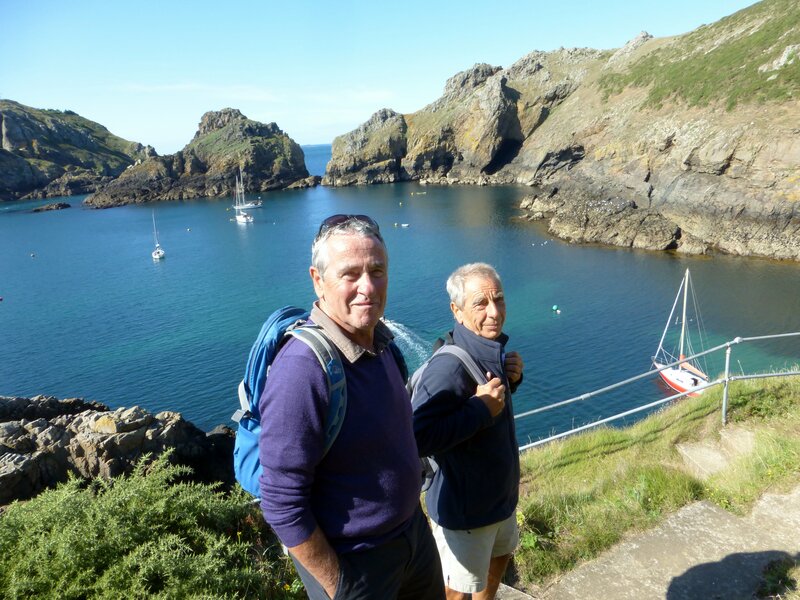 Over to Guernsey where Paul and Susan, fellow walkers from Exeter, were moored on their way home after summer in Brittany. 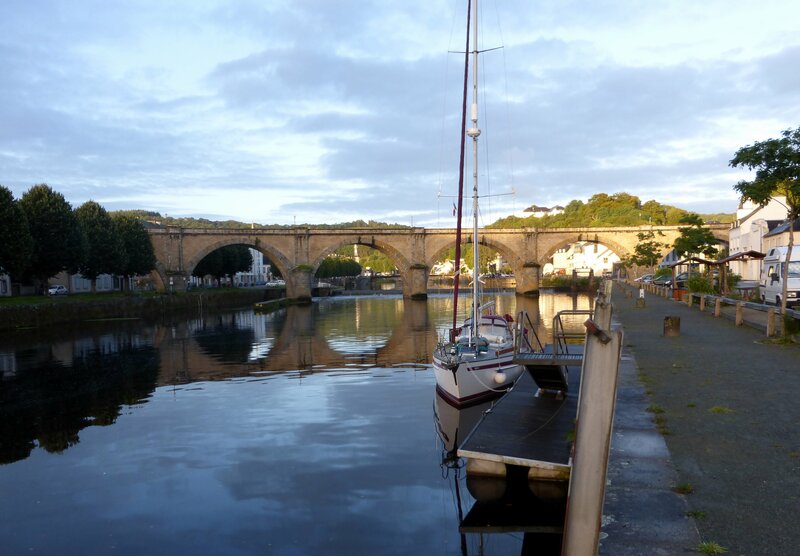 They came aboard for supper and shared tips on ‘best places’ in Brittany. They have an immaculate Nauticat that’s their summer home. (Boats are always eyeing up one another to see who’s most prettily polished – or scruffily informal.) Their boat ‘Patience’ is very very smart – makes me feel in need of beauty treatment. 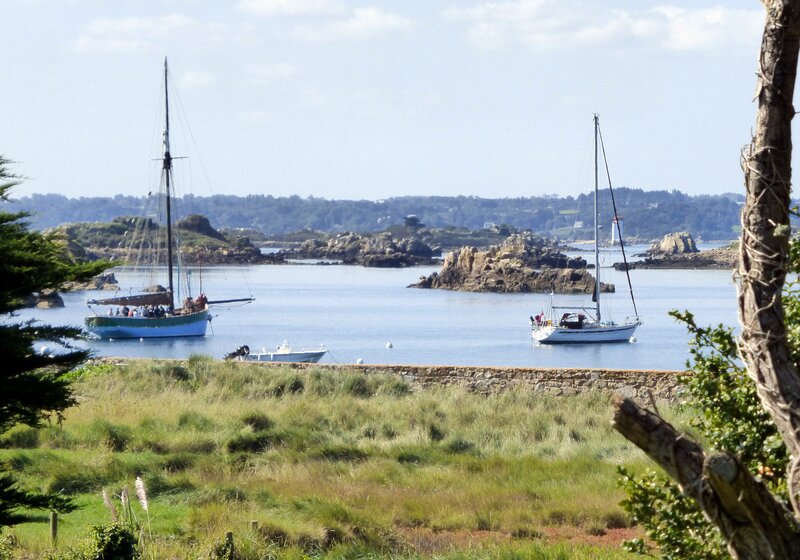 From Guernsey, south again to Ile de Brehat and upriver Trieux next day to the little town of Pontrieux, where Stuart found a train home to Ipswich. Actually, not one train but four or five, I think. A sunny day ashore wandering among the immaculate stone walls, clipped hedges and profusely flowering pink and blue hydrangea. Others know of Ile de Brahat’s delights too and there are hundreds of day visitors who stroll ashore from the vedettes shuttling back and forth to the mainland. Back with Henrietta, M swims and works on the sun-tan. (I suspect he’s vain.) Bob H washes scrupulously and is naturally tanned. 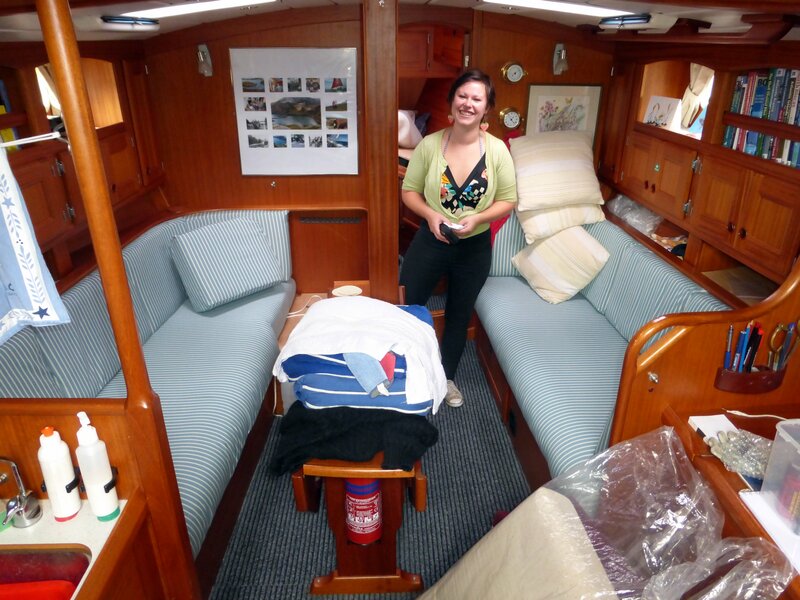 It’s a joy to have odour-free crew and a tidy saloon. Just don’t look in M’s cabin. As I’ve said, it was time to head west and south. 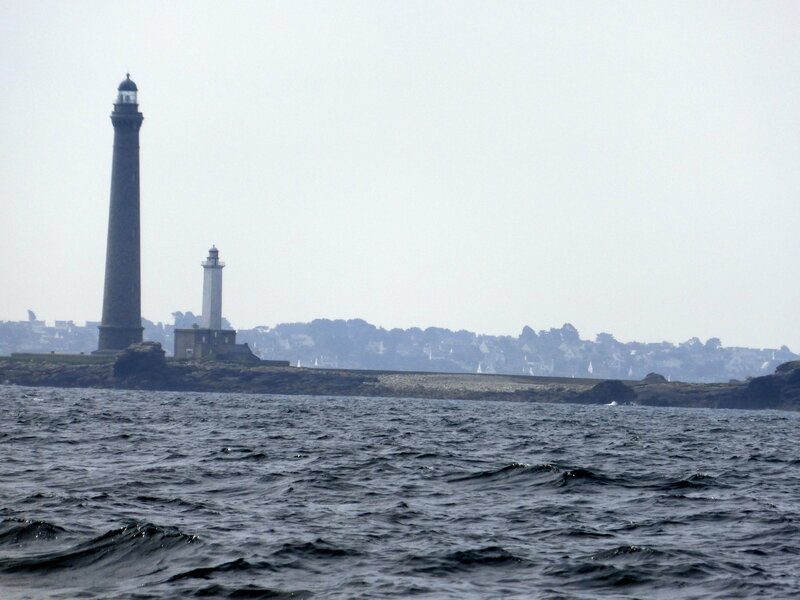 From Ile de Brehat, a fabulous windy sparkly day and helpful tide took us along the Brittany coast past Roscoff to anchor off a small island called Siec. There were some little boats and lots of pots, but no sign of people. Just a couple of wartime ruins and one house with a roof on. On west next day and round the corner at the top left of France, to end up in L’Aber Benoit. It’s a tranquil and pretty spot, strewn with the things you need to farm oysters (a shame that neither M nor Bob likes oysters and think it strange that some people start to dribble at the thought – yuk! )…a walk inland was good, though we coincided with early-closing for the local shops…..Next day, despite a pre-dawn departure, it became clear that, with gentle wind, we wouldn’t get through Chenal du Four before turn-of-tide would make it too tricky. 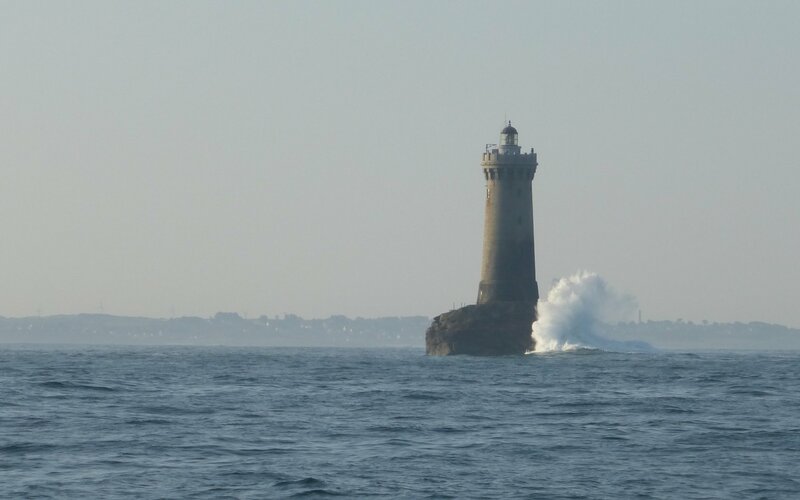 Hence, a reason for another destination-flip….it’s Ile Molene in M’s sights now, not Camaret. As it turns out, Ile Molene is a gem just south of Ushant: lots of rocks, a sheltered anchorage, loads of blackberries, a well-loved Catholic church with flower-filled graveyard, sandy beaches, a cool beer. 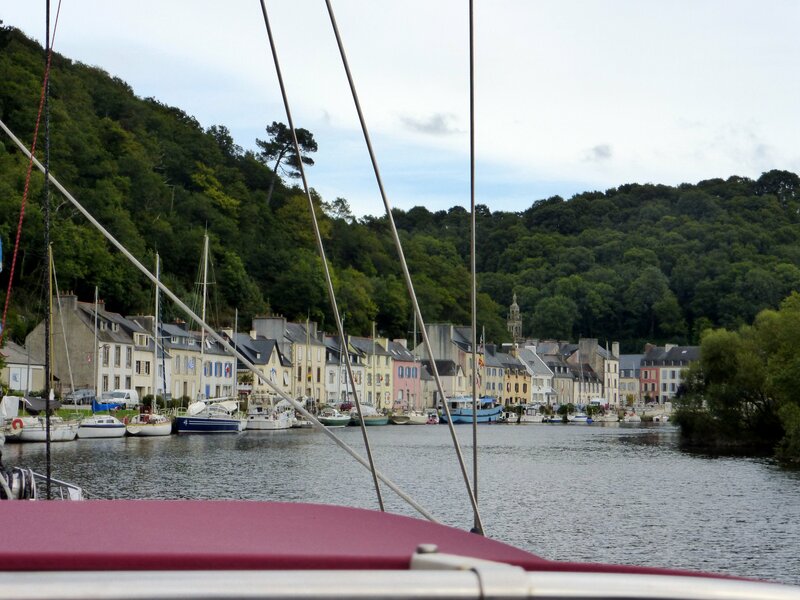 Apparently 200 people live here.….Next day another pre-dawn start for the sail – east this time – past Brest (we were politely ordered to alter course to let a submarine go by), and on about 15 miles up meandering river Auline, through a lock and on to Chateaulin. We seem to be the only visitors, but it’s very peaceful and there’s a huge Leclerc suermarket down the road. The weather forecast isn’t very rosy. This entry was posted in 2015 England to Cape Verde, Older Posts on 12 September 2015 by michaelsweet50.